PE0231. LADY, BE GOOD (George & Ira Gershwin), w.George Gershwin & Percival Mackay (Pfs. ); Jacques Heuvel Cond. Orig. London Empire Theatre Cast: Fred & Adele Astaire, George Vollaire & William Kent; plus additional songs by Monty Woolf, Buddy Lee and the Gilt-Edged 4, etc. (England) Palaeophonics 122, recorded 1926, Complete, as Recorded, w.Elaborate ‘The Play’ 20pp. Brochure replete w.photos from the London production & facsimile of original brochure. “LADY, BE GOOD! premièred on Broadway at the Liberty Theatre on 1 December, 1924 and closed on 12 September, 1925, after 330 performances. The musical was staged by Felix Edwardes with musical staging by Sammy Lee and scenic design by Norman Bel Geddes. 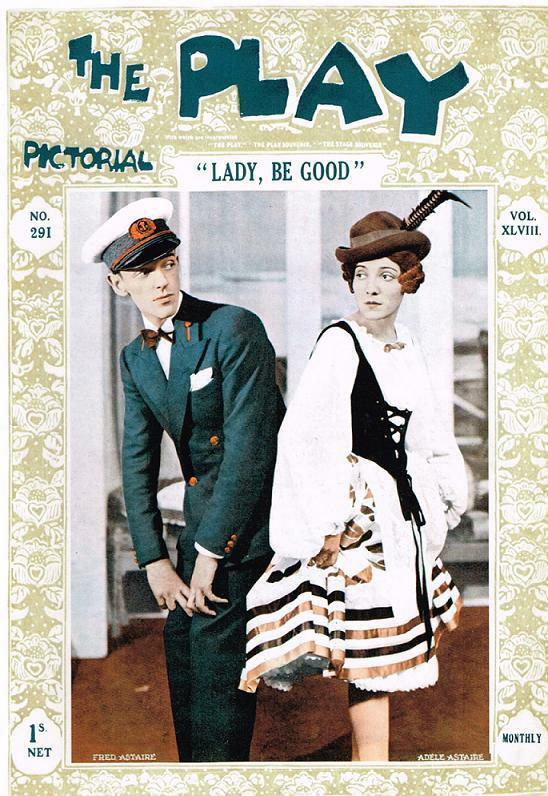 It starred brother and sister performers Fred and Adele Astaire. It then opened in London’s West End at the Empire Theatre on 14 April, 1926, again starring Fred and Adele Astaire. It played strongly there, running for 326 performances. LADY, BE GOOD! embodies several milestones which make it memorable for more than just its foot-tapping entertainment value. It was the first full-length collaboration between George Gershwin and his lyricist brother, Ira Gershwin - a partnership which gave birth to an unprecedented number of deftly crafted standards -- as well as the Gershwins' first collaboration with the already popular brother-and-sister dance team of Fred and Adele Astaire. It was around the Astaires' phenomenal talents that Guy Bolton and Fred Thompson crafted the fluffy situation comedy, full of snappy dialogue, that formed the basis for LADY, BE GOOD!, and it was for them that Gershwin developed a style of parlando song for non-singers - a sort of syncopated patter song - which threw his brother's smartly articulate lyrics into bold relief. Indeed, the Astaires became the visual incarnation of the score's visceral pull. Finally, in LADY, BE GOOD! jazz and blues-inflected melody melded with musical comedy with unprecedented expansiveness, richness, and rhythmic compulsion. ‘Fascinating Rhythm’, one may well say! “Though George Gershwin’s initial effort created little interest, ‘Swanee’ (lyrics by Irving Caesar) - turned into a smash hit by Al Jolson in 1919 - brought Gershwin his first real fame. In 1924, when George teamed up with his older brother Ira, ‘the Gershwins’ became the dominant Broadway songwriters, creating infectious rhythm numbers and poignant ballads, fashioning the words to fit the melodies with a ‘glove-like’ fidelity. This extraordinary combination created a succession of musical comedies, including LADY, BE GOOD! (1924), OH, KAY! (1926), FUNNY FACE (1927), STRIKE UP THE BAND (1927 and 1930), GIRL CRAZY (1930), and OF THEE I SING (1931), the first musical comedy to win a Pulitzer Prize. Starting with his early days as a song composer, Gershwin had ambitions to compose serious music. 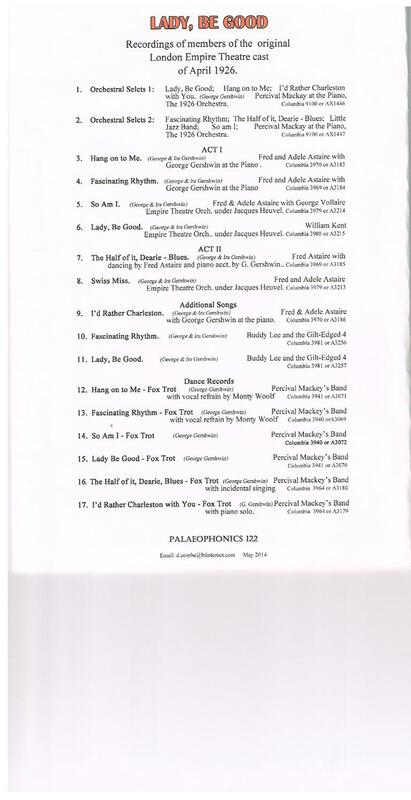 Asked by Paul Whiteman to write an original work for a concert of modern music to be presented at Aeolian Hall in New York on 12 February, 1924, George, who was hard at work on a musical comedy, SWEET LITTLE DEVIL, barely completed his composition in time. Commencing with the first low trill of the solo clarinet and its spine-tingling run up the scale, RHAPSODY IN BLUE caught the public's fancy and opened a new era in American music. In 1925, conductor Walter Damrosch commissioned Gershwin to compose a piano concerto for the New York Symphony Society. Many feel that the CONCERTO IN F is Gershwin's finest orchestral work. Others opt for his AN AMERICAN IN PARIS (1928) or his SECOND RHAPSODY for piano and orchestra, which he introduced with himself as pianist with the Boston Symphony under Serge Koussevitzky in 1932. In 1926 Gershwin read PORGY, DuBose Heyward's novel of the South Carolina ‘Gullah’ culture, and immediately recognized it as a perfect vehicle for a ‘folk opera’ using blues and jazz idioms. PORGY AND BESS (co-written with Heyward and Ira) was Gershwin's most ambitious undertaking, integrating unforgettable songs with dramatic incident. George Gershwin was at the height of his career in 1937. His symphonic works and three PRELUDES for piano were becoming part of the standard repertoire for concerts and recitals, and his show songs had brought him increasing fame and fortune. It was in Hollywood, while working on the score of THE GOLDWYN FOLLIES, that George Gershwin died of a brain tumor; he was not quite 39 years old. Countless people throughout the world, who knew Gershwin only through his work, were stunned by the news as if they had suffered a personal loss. Some years later, the writer John O'Hara summed up their feelings: ‘George Gershwin died 11 July, 1937, but I don't have to believe it if I don't want to’.